James Bond: 007 Average 0.00/5 - out of 0 total votes. 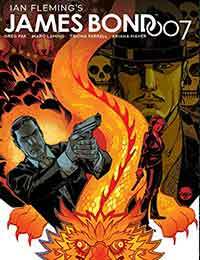 The ODD JOB epic begins in a new ongoing James Bond comic series by superstars GREG PAK (Planet Hulk, Mech Cadet Yu) and MARC LAMING (Star Wars, Wonder Woman)! Agent 007 tracks a smuggler into Singapore to secure a dangerous case, contents unknown. But a Korean mystery man wants the case as well, for very different reasons. And if Bond and this new rival dont kill each other, the ruthless terrorist organization known as ORU will be more than happy to finish the job.